These four videos introduce elementary science educators to important strategies based on the Framework for K-12 Science Education for K-12 Science Education and the Next Generation Science Standards (NGSS). The class featured in the videos is made up of second- and third-grade bilingual students. This collection of videos demonstrates new instructional strategies in the elementary school classroom. The project was led by the National Science Teachers Association (NSTA) with funding from Disney. Achieve and the Teaching Channel collaborated with an elementary school teacher and high school teacher from Boone County, Kentucky, to illustrate how some educators are transitioning instruction to help students meet the goals of the NGSS. These 8 videos introduce science teachers to important strategies based on the Framework for K-12 Science Education and the Next Generation Science Standards (NGSS). This collection of videos highlights the major shifts in science instruction, explore the new role of the teacher, and demonstrate new instructional strategies in the high school classroom. The project was led by the National Science Teachers Association (NSTA) with funding from Disney, and the video and lesson development was led by CREATE for STEM Institute at Michigan State University, in partnership with Concord Consortium, and The University of Michigan. See related lesson plan, "Making and Discussing Models." See related lesson plan, "The Nature of Matter." See related lesson plan, "Observing Evidence." See related lesson plan, "Rutherford's Gold-Foil Experiment." See related lesson plan, "Models of Atomic Structure and Thomson's Experimental Model." 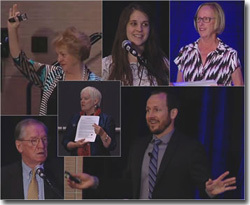 Five educational videos on the Next Generation Science Standards (NGSS), each one hour in length, were shot during the 2014 NSTA National Conference in Boston. Explore NGSS curriculum planning, classroom instruction, resource evaluation, connection to Common Core, and assessment with these videos full of valuable content. Sessions are presented by NGSS writers, state science supervisors, assessment experts and others. Achieve and the Teaching Channel collaborated to produce videos that present an overview of key innovations in the Next Generation Science Standards (NGSS) and offer a deep dive into each of the three dimensions. Paul Andersen teaches science at Bozeman High School in Bozeman, MT, and is the 2011 Montana Teacher of the Year. His YouTube NGSS video collection includes a series dedicated to the NGSS. It covers the eight science and engineering practices, seven crosscutting concepts, and the disciplinary core ideas. What Has NGSS Taught You? Catch Stephen Pruitt’s presentation from NSTA’s 2015 National Conference in Chicago: “Top 10 Things I Learned in 2014.” With his trademark wit and wisdom, Stephen describes lessons learned from his work with states on NGSS adoption and implementation. His message will resonate with teacher and administrators, in adoption and non-adoption states alike, as they think about how to transform science instruction in their own classrooms and schools.